A 48-hour 1600km journey between Pretoria and Cape Town, with off-train excursions in Kimberley and Matjiesfontein. A 24-hour 550km journey along the spectacular Garden Route between Cape Town and George, with a wine estate excursion. A 55-hour journey from Pretoria to the Victoria Falls via Botswana to Zimbabwe. A 55-hour Safari between Pretoria and Durban, including game drives in Nambiti and Spionkop Nature Reserves, a Battlefields Tour conducted from Spionkop Lodge and a visit to the world famous Ardmore Pottery Ceramics Studio. Our 1954 Convair 440 Aircraft and 1944 DC 3 are available for charter from Lanseria Airport, Johannesburg. 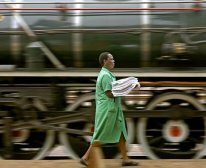 An epic journey into the heart of Africa takes place in July every year when Rovos Rail departs on a 14 day (6 100km) Edwardian Safari from Cape Town to Dar Es Salaam, via Kimberley, Pretoria, the Madikwe National Park, Botswana, Bulawayo, Victoria Falls, Lusaka and through Tanzania to Dar Es Salaam. The journey is characterised by various off-train excursions and is one of the most famous train journeys in the world. An annual 3 400km journey to Swakopmund in Namibia in May. The train takes 6 nights/7 days to reach Swakopmund with an off- train excursion in Kimberley, a visit to the Fish River Canyon, a city tour and game drive near Windhoek and an overnight stay at a game lodge in Etosha National Park with two game drives. An annual 9-day African Collage journey between Pretoria and Cape Town in May/June. This trip takes the train via Malelane, Hluhluwe, Durban, Bloemfontein, Port Elizabeth, Oudtshoorn, George and onto Cape Town with various off-train excursions. A tri-annual 9-day Golf Safari in April, August and December which takes the guests to a selection of the finest golf courses in South Africa combining scenic beauty with renowned game and cultural attractions. A round trip with an interesting itinerary for non-golfers departing from Pretoria and travelling via Phalaborwa, Swaziland, Durban, Ladysmith in the Drakensberg, Sun City and back to Pretoria. A 17-day Southern Africa Air Safari departs twice a year. 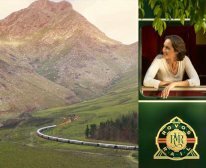 The Safari begins in the wine lands of Stellenbosch followed by a 48-hour train journey from Cape Town to Pretoria. Continue by air onto Phinda Game Lodge, Plettenberg Bay, Cape Town, Swakopmund, Okavango Delta, the Victoria Falls and back to Pretoria. 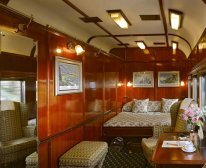 Rovos Rail offers accommodation of an unmatched standard combining the opulence of pre-war travel with subtle modern innovations. Each of the individually air-conditioned suites accommodates two people offering the option of twin or double beds. The Royal Suites (16m2) each have their own private lounge area and feature a full en-suite bathroom with shower and Victorian bath. The Deluxe Suites (11m2) each have a lounge area and private en suite bathroom with shower. The Pullman Suites (7m²) have a room with bench seat during the day which converts to double or twin beds for the evening. They also have an en suite bathroom with shower. All the bathrooms have a hairdryer and shaver point. Breakfast, lunch and a formal dinner are served in one sitting only in the charming Victorian atmosphere of the Dining Cars - meals carefully prepared are complemented by a selection of excellent South African wines. Attire that is more formal is worn in the evening on the "Pride of Africa". A jacket & tie is a minimum requirement, please. The Observation Car seats 32 passengers and takes up the rear end of the train. The adjacent coach contains a smoking lounge which seats eight. At the centre of the train we have, when numbers dictate, a non-smoking Lounge Car, which comfortable seats 26 passengers. In maintaining the spirit of travel of a bygone era, there are no radios or television sets onboard and the use of mobile telephones is confined to the privacy of the suites. Smoking of cigarettes and cigars only is allowed in the privacy of the suites and in the Smoking Lounge. Passengers are advised to take anti-malarial precautions as might be prescribed. Use of steam has become increasingly difficult over the past years, as more and more water and coaling facilities have been scrapped. Where facilities no longer exist, diesel or electric locomotives will be used. Rovos Rail will, however, endeavour to ensure that arrivals and departures in Pretoria are steam hauled. The headquarters of Rovos Rail has now been established at our own station in Capital Park. Situated on Paul Kruger Street, 3km north of the city centre, this new 60-acre facility has provided our company and trains with a magnificent home and without a doubt the most outstanding private station in the world today. We also have a spaciously elegant lounge and office opposite the station entrance in Cape Town. The onus is upon the client to ensure that passports and visas, as may be required, are valid. Cancellation insurance is compulsory. Our terms and conditions will be strictly adhered to and cancellation fees, where applicable, will not be waived. The Royal Suites (16m2) each have their own private lounge area and feature a full en-suite bathroom with shower and Victorian bath. The Deluxe Suites (11m2) each have a lounge area and en-suite bathroom with shower. The Pullman Suites (7m2) have a room with bench seat during the day which converts to double or twin beds for the evening. They also have an en suite bathroom with shower. All the bathrooms have a hairdryer and shaver point.